We have just finished working on our new product (finally!). MIDI Splitter is a 1-in 4-out MIDI thru box. What makes it unique in comparison to other thru boxes is the fact that it can be powered by a 9V battery (which will last for a very long time) or by a typical 9V power supply (the same that you use for your stompboxes). 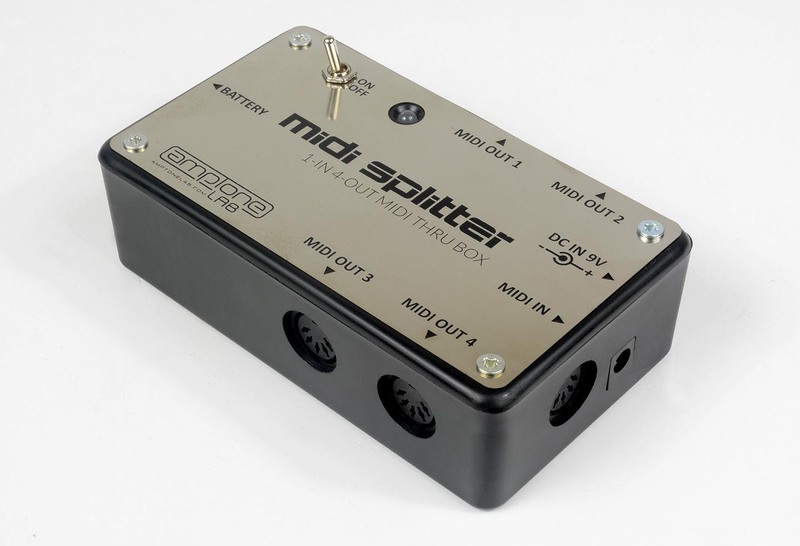 MIDI Splitter will automatically use power from the power supply if it is connected to the device, using the battery only as a backup – just like most guitar effects. You may find some MIDI thru boxes that are MIDI-powered (require no battery or power supply). It is a great feature but… it doesn’t always work. Not every MIDI device can power the thru box – if it turns out your MIDI controller is one of them, you would end up with a useless thru box. That’s why we decided to take the reliable and universal approach and simply power it with a battery and a power supply. All parts and documentation have been ordered last week and if everything goes well, we should receive them and assemble the first batch of MIDI Splitters within couple of weeks. Hopefully before Christmas! Federico from Liuteria Cesarini has recorded a fantastic video demonstration of his XY MIDIpad mini guitar. The guitar is equipped not only with XY MIDIpad mini, but also Fuzz Factory and Fernandes Sustainer, which is a perfect combination for playing crazy sounds! Click here to watch the video on YouTube. And once again it comes straight from the Crimson Guitars headquarters. Ben Crowe has yet again done an amazing job and you can see the effects in the latest Premier Guitar article – XY MIDIpad installation tutorial. Ever wanted to have your unique MIDI controller? Or maybe a custom guitar effect? We can do it for you at MIDI Custom Shop! Click here or click Read more below to visit MIDI Custom Shop website for more details. Visit MIDI Custom Shop Facebook page to stay up to date! Ra Black from Monarchy using XY MIDIpad mini! Ra Black from English band Monarchy is using our XY MIDIpad mini. He installed it in his transparent telecaster guitar. Click here to see the recent Monarchy performance with Ra with his guitar. Check out the band’s latest single Disintegration with the gorgeous Dita Von Teese – buy it from iTunes or watch the video on YouTube. Below you can see picutres of Ra’s extraordinary guitar! Click on the picture to enlarge.